I usually spot Ruddy Turnstones in winter, hunkered down on windswept jetties being blasted by salt spray in the company of Purple Sandpipers. Either that, or I see them in spring with hordes of other shorebirds feeding on the eggs of Horseshoe Crabs. 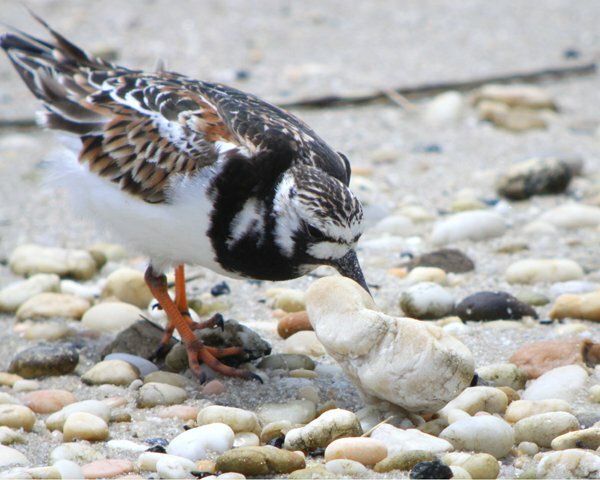 Until last weekend I can’t recall ever spotting a Ruddy Turnstone actually turning a stone so you can imagine how pleased I was to see several doing just that on a rocky beach at Brigantine on the day after the World Series of Birding. It was fun to watch the turnstones actually turning stones though it was frustrating to try to digiscope them in the act of flipping a rock to look for juicy invertebrates underneath. Eventually, with patience and persistence, I succeeded! 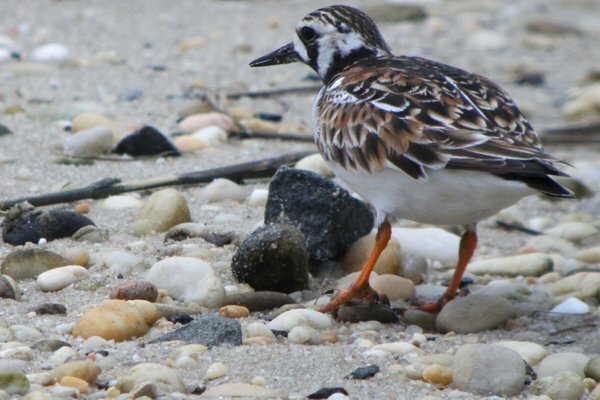 Ruddy Turnstone is a Species of Least Concern according to BirdLife International. It has an enormous range, occurring in such far-flung locales as New Zealand, Saudi Arabia, Alaska, Greenland, and Brazil, to name just a few. 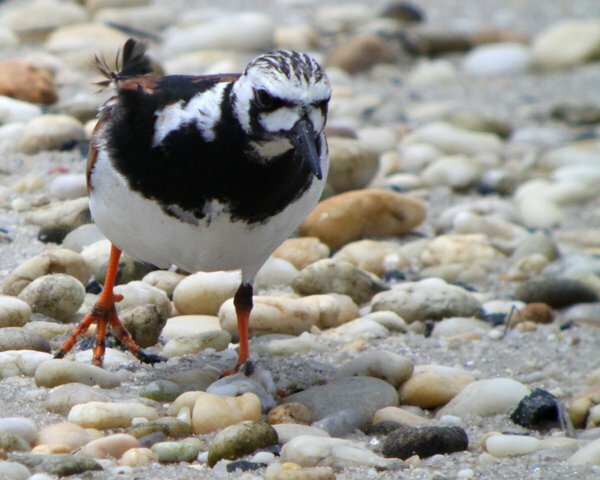 There are a lot of Ruddy Turnstones, likely over 500,000, and though the population appears to be in decline it is not a steep decline. 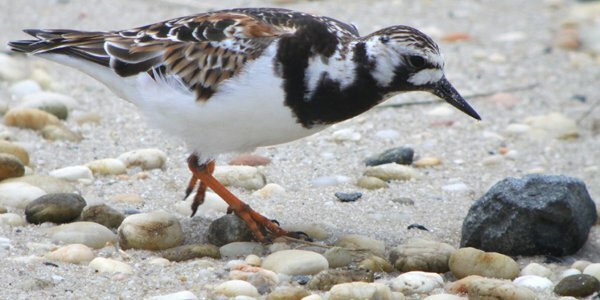 It is one of two turnstone species, the other being the Black Turnstone A. melanocephala, which has a much more limited range. 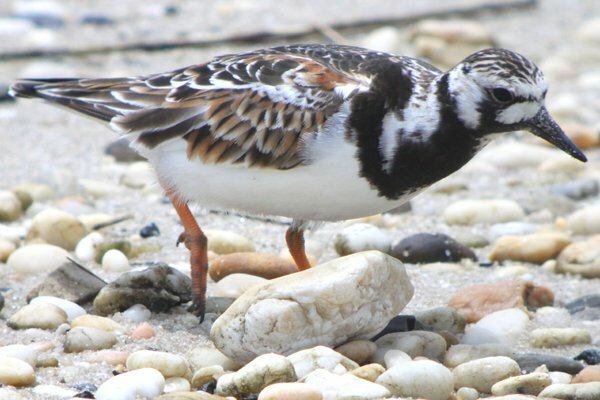 In Europe the Ruddy Turnstone is known simply as Turnstone because it is the only turnstone they have, while in the United States you can occasionally find old-timers who call them Calico Birds for obvious reasons. Whatever you call Arenaria interpres it is a gorgeous shorebird and well worth watching. Here’s hoping you spot a Calico Bird this spring while they are still in their breeding plumage! We have watched them helping themselves to whatever small creatures live on Bar-tailed Godwits rumps-they got a feed and the Godwit was quite unperturbed about the whole event-didn’t even untuck it’s bill! They love maggots in the seaweed in the south of Australia. @Clare: you know … it’s SO good to have you around, Clare! Where Are You Birding This Final Weekend of November 2015? Where Are You Birding This Fourth Weekend of January 2011?